What follows is an edited version of the experiment design and results as posted on the WUWT thread. I would encourage others to conduct similar experiments to check my results. The equipment required is not overly expensive and the results can be observed in minutes. The results appear to show the measurable difference between reflecting LWIR back to warm water when it is free to evaporatively cool and when it can only cool through conduction and radiation. – Two identical insulated water containers. I used rectangular 200ml Tupperware style containers, insulated on their base and sides with foil and Styrofoam. I cut away the clip on rim from each lid to create a frame to clip down cling film for Test B of the experiment. – One IR reflector. I used an A4 sheet of 10mm Styrofoam with aluminium foil attached with spray adhesive. – One IR window. I built an A4 size “picture frame” of 10mm square balsa wood strips and stretched cling film over it. – Optional extras – kitchen timer, an A4 ”dark cool sky” panel of matt black aluminium with peltier cooling, glamorous lab assistant of choice. – Position probe thermometers in identical positions in both water containers. I placed the tips 10mm below the water line by drilling force fit holes in the sides of the containers. – Position the computer fans to blow across the water surface of each container, but do not turn on. – Fill jug with warm water, stir, then fill each water container from the bucket. I used water around 40C as the ceiling was around 18C not a 3k sky. – When and equal amount of water is in each container, turn on the computer fans. 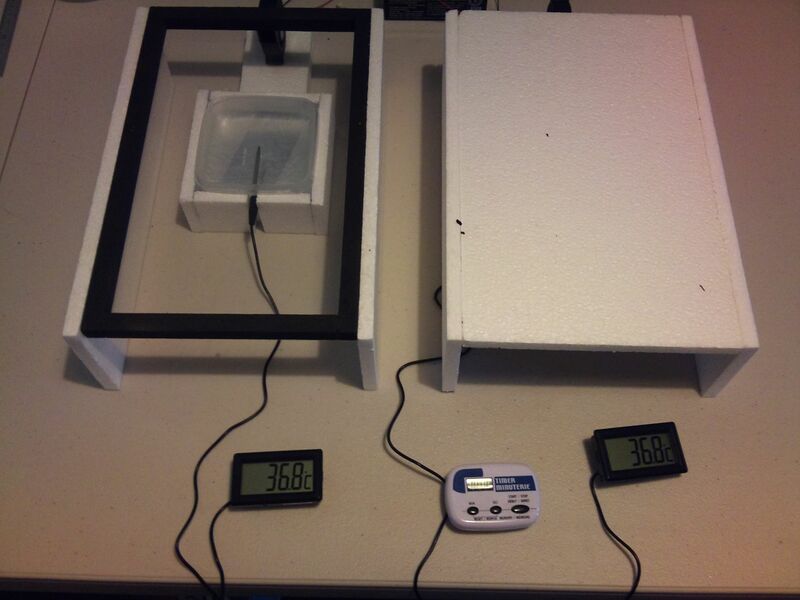 – Observe the temperature change over time for each tank. Less than half an hour is required for such a small amount of water. You should observe that both tanks cool a the same rate (TEST A). – Now the important bit – Repeat the experiment, but this time lay a small sheet of cling wrap on the surface of the water in each water tank. This allows cooling through radiation and conduction but prevents evaporation. You do not need the computer fans on in this test. You should be able to observe that while both containers cool slower than before, water under the IR reflector cools slowest (TEST B). In TEST A the water cools more quickly, however the two water containers temperatures remain very close to each other over time. This indicates that backscattered LWIR has a very limited effect on the rate of cooling for water when it is free to evaporatively cool. In TEST B both water containers cool more slowly than test A, but a divergence in temperature between the two water containers is readily detectable. The container under the foil sky cools more slowly than that under the cling wrap sky. This indicates that backscattered LWIR from a warm material can slow the rate at which that material cools, if radiation and conduction are the only methods for cooling. Test A represents the evaporative cooling conditions in the real oceans. Test B represents how the climate scientists have modelled the oceans with regard to backscattered LWIR. From what I have observed, backscattered LWIR can slow the rate at which substances cool. However in the case of liquid water that is free to cool evaporatively this effect is dramatically reduced. It would appear that including the oceans in the percentage of Earth’s surface that could be affected by backscattered LWIR may be a serious error. Earth’s oceans cover 71% of the planets surface. If backscattered LWIR cannot measurably affect liquid water, then CO2 cannot cause dangerous or catastrophic global warming. I have conducted further tests using a “cold sky” panel cooled with ice water over the top of the cling film IR window. While the temperature divergence in the evaporation restricted test B does not appear faster, it does appear to diverge for longer. I would encourage others to conduct similar empirical experiments and share their observations. I would be interested in comments in further experimental design, or empirical evidence related to the LWIR question. Brilliant! Thanks, Konrad, for a simple experiment which can easily be repeated by anyone. This is good enough to show that the current wisdom from the CAGW cabal is far from the mark and they need to examine their radiative energy assumptions forthwith. Climate science is in a real shambles! Willis Eschenbach had a guest posting over at WUWT in which he claimed that LWIR could heat Earth’s oceans. Infrared range that spans 700 nm to 106 nm (1 mm). It is responsible for an important part of the electromagnetic radiation that reaches the Earth. Repeat this process until sunset. OK perhaps this is not scientific but it proves the sun heats the seas and oceans… and sunlight includes Infrared radiation… so I am with Willis on this one… especially as I tend to roll my eyes when people start talking about reflected / back scattered infrared from the sky / clouds during daylight hours. If I may ask a question. The purpose of this experiment is to show that DLR cannot heat the oceans (those wavelengths redirected to the surface by GH gases). Does this say anything about Short Wave Radiation (from the sun?) heating the oceans or does this experiment exclude SWR? While the experiment you describe sounds more enjoyable, it may sadly be more expensive. Add the cost of tequila to the cost of brand name bikinis for the glamorous assistant and you are talking climate science dollars.. also that experiment does not isolate long wave IR, such as may be backscattered by CO2 from shorter wavelengths. The experiment only deals with long wave IR radiation emitted by 40c water. In fact I have shielded the water containers from incandesent lights when recording runs to eliminate SWR. This is to keep the source close to what would be backscattered by CO2. The foil reflector does bounce back a broader long wave spectrum than the 15 micron wavelength that is a concern with CO2, however if even this cannot slow the cooling of water that is free to evaporatively cool, then the 15 micron band alone would have no chance. MV, nearly all of the incoming solar IR gets absorbed in the atmosphere before it reaches the ocean surface, which it can’t penetrate by more than its own wavelength anyway. Water is pretty much opaque to IR. It all gets absorbed in the first 0.05mm, and causes evaporation, or is simply re-radiated upwards along with the outgoing longwave IR derived from the solar shortwave input. Roy, the experiment excludes shortwave, or at least strong shoortwave such as direct sunlight, which everyone (except Myrrh on the WUWT thread) accepts really can penetrate into and warm the ocean upper layer. In this experiment, Konrad is seeking to demonstrate that DLR (downwelling longwave radiation) from the atmosphere, doesn’t have much effect on the cooling rate of the ocean surface. I had some vague idea of comparing radiative cooling and conductive cooling using a sheet of 3mm mild steel about half a square metre in size. The steel was dark in colour but not rusty. I used a bolt on thermometer probe and lay the steel on a larger section of 50mm thick polystyrene insulation. My intention was to record temperatures day and night in free air flow conditions and then cover the plate with a thin polythene sheet to restrict air flow to the top surface of the plate. The readings I obtained didn’t make a lot of sense to me so I abandoned the experiment. But one anomaly remains stuck in my mind. Just before dawn the plate and local air temperature were the same but as the sky above started to turn blue so the plate temperature warmed about three degrees (c) BEFORE the air temperature started to rise. The sun was still BELOW the horizon. My assumption was short wave back scatter, or Rayliegh scatter, was heating the plate. Reading this thread reminded me of my failed experiment but made me think WATER CAN WARM before the sun rises. I wonder how and if this is accounted for? The experiment is reasonable, but the conclusion wrong. The situation on real oceans corresponds much more closely the second experiment with cover than the one, where evaporation is allowed. How can I justify this claim? The reason is that in the case of the real ocean surface the comparison may be defined in either of two ways. 1) The most straightforward case is that where we compare the energy balance, when temperatures are kept constant and we are looking only at the net energy balance. In this case everything else is fixed, and the only thing that changes is DLR. 2) The second alternative is to allow all temperatures as well as the moisture of the atmosphere settle to a new stationary state, where the incoming and outgoing energy fluxes are equal. This can be reach only by letting the surface and the lower atmosphere warm. Most importantly the absolute humidity of air near surface is higher in this case. The experiments performed doesn’t correspond to either one. The room air and the moisture are practically the same and probably relatively low with and without the IR warming, because the room is big enough to maintain a constant state. In that case the cooling by evaporation is rather strong and remains so throughout the experiment as the room moisture doesn’t rise significantly due to increased evaporation. That alone is enough to invalidate the conclusion that the case A would represent real ocean situation. The case B corresponds reasonably well to the first alternative way of looking at the real case. Developing the case B further to allow slow escape of the moisture would be perhaps an even better fit, but that would require a much more complex experiment where the moisture near surface is measured continuously and the ventilation regulated to keep the relative humidity constant at a high value as it is in the immediate proximity of the ocean surface. A better experiment could be built by adding heating at the bottom of the container and controlling it so that the temperatures remain constant in both cases. The difference would then appear in the power needed for heating with and without IR warming of the top. This experiment would correspond well to the case 1 mentioned at the top of this comment. In real oceans the solar SW does the heating from below. It’s them ‘elves coming out of ‘ibernation, see, it woke up. You do the same at dawn, body heat rises. You did double check the plate was very dead? In Test A the only thing being shown is how powerful forced convection is, and how easily it overides any cooling by the minimal radiation given off by the water. Both tanks cool the same because the fans are identical and have the same cfm. If you want to test the power of forced convection vary the fan speeds. You are assuming a constant wind blowing evenly over the whole ocean. I doubt very much this happens in reality. While in one area there may be turbulence, another area may be fairly quiet. Therefore the rates of convection will be totally different. In Test B the cling wrap alows cooling by radiation and prevents evaporation but conduction is another matter. Do you mean the thermal heat of the water is conducted through the cling wrap? The reason for the slower cooling in test b is because the radiation emitted by the water that escapes thru your IR window is now not escaping with the foil, resulting in a slower cooling rate. Energy previously lost is now used. As for the basis of the experiment, it is most certainly incorrect. is subject to the Compton Effect. Reflection is not backradiation. In addition the ability of the atmosphere to reflect electromagnetic radiation cuts off around 30 Megahertz just above Citizen Band radio. Where are the metallic reflectors in the atmosphere. Where is this mysterious reflector that apparently shells the earth? Most of the solar IR is NOT absorbed by the atmosphere. There is more w/m2 of IR striking the surface than there is visible light. The penetration of IR is not a property of wavelength. It is a property of the absorption of the molecules of water in relation to the frequency of the irradiating source. light can penetrate water to what, a few hundred feet, it does not heat it to any sensible degree. I agree with myrrh. The sun’s infrared is completely absorbed within the first few inches of the surface (and I am being generous). AGW physics is just a well developed pseudoscience. The reason for your plate heating when the sun was below the horizon is due to astronomical refraction of the Sun’s non visible IR. No shortwave backscatter (unphysical) or Rayleigh need apply! I am a reserved person but sometimes I get annoyed by people such as some of the egotists at climate etc who clearly have no understanding of heat and mass transfer. Perry’s Chemical Engineering Handbook has thirty (30) sections. These are some of the sections 3) Mathematics, 4) Thermodynamic 5) Heat and Mass Transfer 6) Fluid and particle Dynamics 7) Reaction Kinetics 8) Process Control 9) Process Economics 12) Psychometry, Evaporative Cooling and Solids Drying 14) Gas Absorption and Gas-Liquid System Design.24) Biochemical Engineering. From all I have seen on Climate Etc and other web sites there is no one who has a full understanding of the basic chemical engineering subjects. One of the so called “team” (with a notable name) it appears does not understand the “Schmidt Number Sc” which can be used in mass transfer calculations associated with mixing. The same person clearly has no idea what occurs in evaporation and condensation. It should be noted that heat transfer and mass transfer are different. The driver of mass transfer is a concentration diference expressed by partial vapor pressures in gas-gas or gas-liquid systems. In forced heat convection the driver is temperature difference between the surface and the incoming moving fluid. ~67W/m^2 is. What is your definition of IR? All the way to the edge of visible? Frequency relates to wavelength. They both relate to the relative opacity of water to them. The coefficient of absorption of visible light in seawater is such that it provides enough heat to account for the temperature profile of the ocean below 0.5m. Near IR which makes it through the atmosphere is indeed absorbed in the top ~0.5m of the ocean and contributes to the temperature profile of the near surface layer. Mixing does occur from a small distance below the surface. However, this distance is still many hundreds to thousands of times deeper down than the distance ‘back radiation’ from the atmosphere penetrates to. Although the coefficient of absorption of pure water is small, there’s a lot of energy arriving from the Sun in the visible part of the spectrum, and the sea water, and the small biota and metallic ions it is teeming with, have had a very long time to absorb it and spread it around. It’s all about the absorption vs the rate of cooling. I’ll leave Konrad to deal with your criticisms of the experimental method he has employed. That is the exact issue that needs to be resolved. I have described and considered that point at length elsewhere. That statement represents the application of Fourier’s Law which provides (I think) that the flow of energy across a boundary is proportionate to the temperature differential either side of it. However I have come to the conclusion that the combined effect of increased evaporation plus upward convection radiation and conduction from the warmed molecules at the very TOP of the ocean skin removes the energy added by DLR fast enough to prevent any change in the temperature differential at the interface between the ocean bulk and the BOTTOM of the skin layer. Thus the 1mm deep cooler ocrean skin acts as a buffer between the DLR and the ocean bulk. i) That little ‘hook’ in the temperature profile from warm to cool of 1mm depth below the actual surface and above the bulk remains present day and night. If it is not removed by solar input on a diurnal basis I don’t see how it could be affected by a little more DLR. ii) That coolness of 0.3C 1mm deep appears to be a fixture of the oceans averaged globally. There seems to be no evidence of significant variation on a globally averaged basis. iii) If DLR were to reduce the rate of energy flow from the ocean bulk to the skin layer then the depth and intensity of the temperature change at that bulk/skin interface must change but there is no evidence that it does if averaged globally. iv) There is a nice analogy available namely the concept of a tributary joining a river. The downstream VOLUME of flow may increase but there is no need for any change in the RATE of flow from UPSTREAM in either river or tributary except maybe in a small buffer zone around the actual junction. So it appears to be similar where the energy flow from the bulk meets the energy flow from the DLR within the ocean skin which is most likely a similar type of buffer zone. In the case of river and tributary gravity determines the flow rates. In the case of ocean and skin atmospheric pressure determines the flow rates. v) Evaporation being an energy hungry process (5 times more energy taken up than is required to provoke it) and since the energy shortfall is taken from where it is most readily available it seems most likely that the shortfall will be taken from any remaining DLR once increased radiation conduction and convection have taken their slices. So it seems to me to be unlikely that Tim’s point 7 is correct. I saw something that led me to believe that those ‘in the know’ are aware of this issue and that experiments are in the design stage but not yet ready for deployment. Konrad, can you possibly repeat your experiment outside under the night sky with the reflactive plate laid flat and pointed upwards. You would then be using actual DWIR and not reflected IR. Konrad, of course the results should now reverse with the “IR Window” water staying warmer due to the DIR. Water is pretty much opaque to IR. I think the H2O absorption bands and ocean heating argue against this…. I think my experiment argues against this and that the oceans act as heat sink for solar radiation. As one can see, a good portion of the sun’s radiant EM energy is in the visible range at ~46%, with infrared region accounting for 49% – the missing ~5% is UV and all other EM wavelengths not categorised above. The photovoltaic cell converts the energy in the visible spectrum to electricity as do plants via photosynthesis. It is the visible component of insolation which is responsible for heating the oceans – it is only pure water that is almost ‘transparent’ to visible light, but sea water is not transparent due to particulates and dissolved minerals e.t.c. The absorbed visible light wave photons give up their energy to sea water mainly as thermal energy and it is this, not IR which keeps the oceans warm. So please, can we accept some basic physics and keep the discussion focused on Konrad’s simple but profound experiment! The definition of IR or non visible radiation is that which starts just beyond the visible color red. It appears that you are using numbers from the K@T cartoon. The numbers used in this diagram are completely meaningless. The amount of IR (entire band not just near IR) absorbed by the atmosphere is way higher than a measely 67w/m2. Here is a simple calculation. 1366w/m2:input to the earth system. At zenith the surface receives 527w/m2 IR, 445w/m2 visible and 32w/m2 UV. Oxygen and nitrogen do not absorb radiant heat. Total irradiance is 527+445+32=1004w/m2. 1366 – 1004=362w/m2 of IR. So the absorption by the atmosphere is much closer to 362w/m2 than 67w/m2. 362/1366×100=26.5% IR absorbed by the atmosphere. 527w+362w=889w/m2 of IR. The ratio of non viisible to visible is 889:445. This is very nearly a 2 to 1 ratio.My suggestion for this pseudoscientific cartoon is to blow it up, stick it on the wall and use it for dart practice. The absorption of water is due to its molecules and not the radiation bombarding it. By claiming .4 for for a coefficient you are claiming a selective absorption for water. There is no way .4 is right. I’d pick 1.2. In Tyndall’s experiments on volatile liquids he says “Here for a thickness of .02 of an inch we find the absorption varying from a minimum of 5.5% in the case of bisulphide of carbon, to a maximum of 80.7% in the case of water. The bisulphide, therefore transmits 94.5%, while the water — a liquid equally transparent to light — transmits only 19.3% of the entire radiation. At all thicknesses, water, it will be observed, asserts its predominance. Next to it, as an absorbent, stands alcohol; a body which resembles it chemically.” From the same experiment a layer of water 0.27 of an inch thick is competent to absorb 91% of the entire radiation. The source: a platinum spiral raised to incandescence. All I know is that the human body is largely water with compounds (salts etc) When this human plays golf in the summer (me) the sun burns my skin so I seek the shade which is cooler. In the winter when it is cool, I search for the sun to feel a little warmer and avoid the shade. Sunlight is energy and surfaces absorb that if it is not reflected. When it is windy, the body feels cooler as long as the nearby temperature is lower than the body temp; unless the humidity is low, in which case the sweat will evaporate to cool the body even when it is hot out. So my conclusion is that the sun pumps energy into anything that will absorb it or else that thing reflects the energy back toward the sun or off toward something else that might absorb or reflect it. The wind works to promote evaporative cooling whenever the humidity in the vicinity of the water supports evaporation and that causes cooling. Water does transfer energy in normal ways to surface air and forced convection would seem an optimum method. So since there are windy conditions all over the globe and oceans, energy transfer occurs and varies with the local conditions. Foil is used in cooking and there we are, it restricts convection some , and holds in the vapor. Bottom line is the sun warms the oceans, the winds cool the oceans and radiation occurs as appropriate for the temperature difference at any given point. The experiment is ok for what it is trying to prove. Thanks Konrad for the time and effort expended in trying to quantify the effects of DLWR. Once again radiative heat transfer near the Earth surface has been shown to be a minority player. Any suggested modifications to your experiments will confirm this IMHO. Replacing clingfilm (made from PVC emissivity 0.82) with LDPE film made from polyethylene which is IR transparent. Replace aluminium foil with black cardboard. The aluminium will reflect virtually all radiation thus boosting artificially the “backradiation” which comes from emission process. Add a third digital thermometer to measure the ambient room temperature. Place all three thermometers in the same water to ensure identical readings. Get a data-logging interface for your laptop. My first computer(a BBC micro) had all these already buit in. 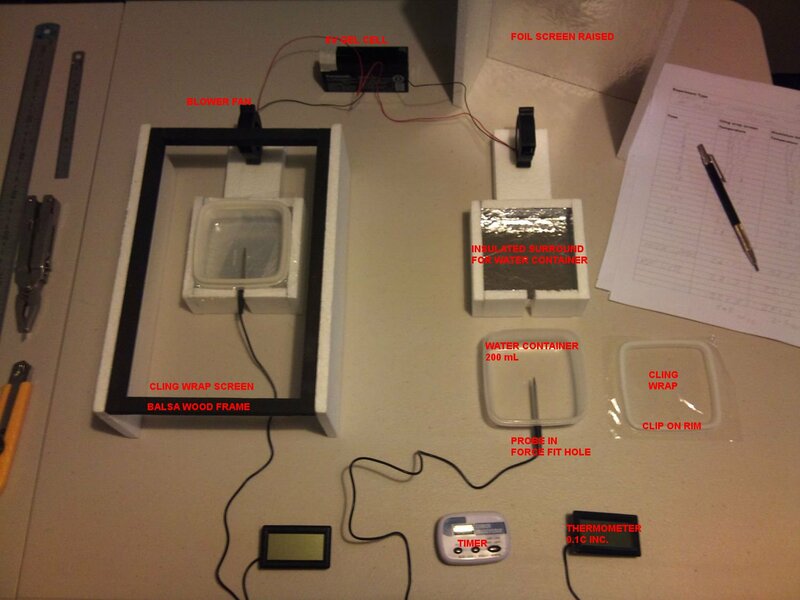 This will enable you to collect results from dark room to simulate night time conditions. Nighttime eliminates the solar contribution and thus gives the best “backradaition” effect. Vibrate both containers simultaneously to simulate “waves” this will combine with your forced convection or “wind” and will increase evaporation hence mass transfer. Brian, I’ll follow up the numbers soon I’m away from home so no access to data. Many years ago, A friend and I were hiking the ridge trail of the Warner Mountains. This was in late October it was cold, with rain and snow. After a very cold night at the tree and snow line, at 7000 foot elevation. We awoke to an absolutely clear and calm day. The trees had long icecicles in them and the grass and tree limbs were covered with thick whorefrost. As we advanced up the ridge, at about 10:30 am, we came apon a small cirque lake, about 150 feet in diameter and 6 feet deep, very clean and clear, on the eastern side of the ridge. The water was quite warm in the surface i.5 feet and very cold below. Warm enough for a bath, which we enjoyed before continuing up the ridge. I have yet to try the experiment outside, however I see there could be some benefit in having a cold sky rather than a warm ceiling over the IR window side. However I have intentionally used foil over the IR reflector side so as to increase the amount of backscattered IR. This make the results of the experiment more easily measurable. It also shows that if far greater than normal backscattered LWIR cannot effect the cooling rate of water that is free to evaporatively cool, then the minor increases from CO2 in the real world will have no effect. Thanks for the suggestion regarding LDPE being more transparent to IR than cling film. As the use of foil, I am trying to over do the amount of LWIR being backscattered to make the effects measurable. If a larger than realistic amount of LWIR being backscattered in test A cannot cause a detectable difference in cooling rate, then real world quantities have no chance. However I do agree that a dark room would be best for testing, and I have been switching off overhead lights for recorded runs. Further to this I am building a peltier cooled matt black aluminium plate to place over the IR window side. At present this side is receiving some LWIR from the ceiling and reducing this will increase the IR difference on each side of the experiment. I believe waves, and the possibility of turbulent mixing of the skin layer may have to wait for a larger setup with more thermometers at different tank levels. Thanks again, Konrad, for showing how real science should be done. Theories that rely on empirical evidence from the real world have little value. Please keep going with your experiments, as once the methodology is refined and as I expect, a negative result for LWIR over the oceans is found, it will be the deathblow for the CAGW meme and avoid an enormous and costly mistake being made by our manipulative politicians. The history of science that just one simple experiment or observation can cause a paradigm shift in how we view our world. Thanks for the response, I was just concerned that the CAGW crowd would say that you weren’t testing the “real” DIR. But as you say if more and amplified DIR can’t do it, what chance has the much weaker real thing. Konrad, have you seen Dr Van Andel’s experimental results here http://climategate.nl/wp-content/uploads/2010/09/KNMI_voordracht_VanAndel.pdf in a presentation to KNMI. That is a very interesting paper, thank you for sharing it. Yes Cementafriend, the understanding of the actual physical realities of the masked assimilation of heat energy in a change of state – liquid water to water vapour – is not well understood; how is the extra heat energy present in H2O vapour stored given that there is no increase in the rapidity of random motion of the vapour molecule? Presently the masked energy is supposed to result in unexplained motion within the molecule. Also, how and why does the return of that hidden heat energy within the molecule result in radiated energy with no change to the rapidity of the random motion of the combining molecules? There is a mystery here that does not have a satisfactory answer if heat energy results from the rapidity of the random motion of molecules. Here is a simple calculation. 1366w/m2:input to the earth system. At zenith the surface receives 527w/m2 IR, 445w/m2 visible and 32w/m2 UV. Most of the Earth never sees the sun at zenith. How do you calculate the average insolation from your numbers? light can penetrate water to what, a few hundred feet, it does not heat it to any sensible degree. I agree with myrrh. If you looked at that graph at the top of the Wikipedia page, you would see that the absorption coefficient for light in water is in the range of about 0.0001 to 0.01 per centimeter. This means that over distances between 100 cm (red) or 10,000 cm (blue), the light energy will be reduced to about 36.8 percent of its original level (one divided by the base of the natural logarithms) and thus 63.2 percent is absorbed, or converted to heat along the way. When anyone says water is ‘perfectly transparent,’ they usually are referring to distances that are less than 10 cm. Thanks for the link to that paper. It was interesting to see someone else achieve useful results from small scale experiments. I am grateful to see experiments being tried. Ultimately if one increases evaporation one decreases SWR, and in a complete experiment this must be considered also. My comments at WUWT explains it several ways, but no one comments, so either my concern is unjustified, or no one knows how to incorporate these facts into an experiment. Tim, the ocean can cool even if the gradient decreases. Simply decrease the amount of SWR entering below the surface and you both cool the ocean and decrease the gradient. Any increase in water vapor reduces SWR reaching below the surface, (via spectral modification of TSI) despite the GHG effect on the atmosphere. Thus water vapor temporairly increases the energy in the atmosphere, while reducing the longer residence time SW energy entering the oceans, thus over time the overall feedback may be negative. I went scuba diving once and at 40 feet it was quite light. I have also noticed in Hawaii, that the sea water temp at the buoys out in the ocean all show a different temp during daylight vs dark. It is at least the best part of a degree difference which is a lot. Bottom line is light penetrates the water and imparts energy. PG, the dark peaty bottom of those pools absorbs sunlight really well, and the water in contact soon warms and rises to the top, where it radiates and evaporates and conducts to the cool mountain air rapidly. This leads to the sharply defined thermocline a foot or so under the surface. The heat is ‘queueing up’ to escape across the air water boundary. rather than one “warmed” slightly by “backscattered LWIR”? Having designed and made various ultralightweight water boilers out of beer cans with the heat source at the bottom and tested them with thermometers placed at several levels in the fluid as it heats, I can vouch for how fast water moves heat around. Even with the rapid heat conduction of aluminium the bottom end stays cool enough to touch until the top end is nearly boiling. But for sure, in your high mountain pool, another factor is the dryness of high altitude mountain air allowing more of the near IR end of the solar spectrum through to directly heat the top water. I think where Myrhh and Brian W are going wrong is that in comparing the degree of heating of the top few inches with the heating of the bulk of the top hundred feet they forget the different volumes involved. As Tenuc correctly stated above, around half the energy being converted from solar shortwave to longwave is in the visible spectrum. But that energy is spread over 100 feet rather than the far visible red and near IR which is absorbed in the top foot or so. In a shallow clear pool the bottom also heats from the shorter wavelengths and conducts and radiates energy upwards. Convection shifts it surprisingly quickly to join the warm top water, because the intervening several feet is only getting a small amount of the middle wavelengths directly heating it, so the temperature differential is high and convection is very effective. Because of this, the temperature of the top foot can be a few degrees warmer than blood and so ‘feels warm’ whereas water only a few degress below blood heat ‘feels cool’. A less subjective study done with thermometers and some calcs on the buoyancy of warm water packets and the rate of escape from the surface will reveal nothing very mysterious is happening. It’s pretty well meaningless when water is transparent to visible and doesn’t absorb it. Empirically determined coefficients of absorption are strong evidence that water does indeed absorb visible light. Better evidence than anything you’ve come up with to say it doesn’t. That the atmosphere is not transparent to visible light is an object scientific fact. Yeah? How come I can see for 50 miles or more from a mountain top on a clear day, and yet it’s completely dark a lot less than a mile under the surface of the sea? corrections to the HITRAN database [Giver et al., J. Quant. climate models based on the HITRAN database. use of the factors set out in Table 1 as an interim solution. and observation fail to agree. I wonder why they use data from laboratory work, when this could be measured in the real environment, where wind, variation in air pressure, boundary effects, e.t.c. would provide real data tables of the effect and circumvent the need for re-scaling of the data on a polyad-by-polyad basis? Science seems to have forgotten that the laws of physics can become at best a poor approximation of reality when dealing with the complex processes in the actual world. Interesting paper, easy to read, I recommend to lurkers and others. gives good observation of abilities of this “settled science”. The problem I think you are addressing is so complex there is no answer as such. Not only is a lot unknown, there is much ongoing work surrounding the whole subject of fluid interfaces. Consider: the sun is exactly overhead at exactly one location, and around that are circles where the incident angle is increasingly shallow. Involved are many things, with polorisation one of them, and yes IR is polarised too, both for incident enegy and emitted energy, nor is either necessarily simple. Surface roughness complicates matters further. Keep in mind that any energy entering water either comes back ought via reflection below the surface or is totally absorbed. Reflection leads to fun. What for example happens when reflected inward solar reflects off the ocean and wacks upwards underneath a cloud? What if it is polorised? I think hand waving is in order here. Note the increase in atmospheric path length for reflected light, longer inwards and then longer outwards. Finally, what about the rusty plate warming before sunrise? What happens when heat at shallow angles is reflected off the ocean, does this head into the dark region? I have in mind here what happens in the Arctic when the sun stays below the horizon… does heat arrive? Tim, in the dark months, what heat does arrive is carried there convectively by the atmophere. I’m wondering if the pre-dawn dew settled on the steel plate and depositied the latent heat of condensation, thus warming it. Seems unlikely the energy would be sufficient to raise its temp several degrees, especially if there was any breeze to assist evaporation afterwards. I see, Tallbloke believes in due process. Nice thinking, there are other things to consider. Isn’t dew the same thing as condensing on the cold surface which has radiatively cooled, and I assume will be prevented from cooling further by the input of phase change heat? That said, I think there are some peculiar processes to do with nucleation etc., if less to do with dew. I agree heat arrives by physical transport, was just wondering whether there is a twilight effect. Figured out roughly how measure this but not the instrumentation. Then there is absorption by water vapour en-route, does this convert to sensible heat? Presumably convected away. Any comment re “insulation” issue with experiment I raised earlier? Would the two tanks of cooling water be differently “insulated”, explaining the temperature difference, rather than one “warmed” slightly by “backscattered LWIR”? I believe what you are asking is if the 10mm of Styrofoam is responsible for the differing rates of cooling rather than the foil reflecting back LWIR. The answer is no. While the foam is an insulator, (and has been used as such around the sides and bases of the water containers) it insulates largely by restricting conduction. In the case of the experiment fans have been used to keep air moving between the water surface and the “sky”, which eliminates the problem of conduction between the water surface and the “sky”. Test B has been conducted with and without fans with no discernibile difference. If however the tunnels supporting the foil and cling wrap “skys” were closed at either end, problems of conductive differences could be expected. I understand the concern about the size of the experiment. When I started this way back on the WUWT thread I was using 5 litre containers, and I can envisage far larger set-ups with waves etc. I will admit to being surprised myself when the effect of backscattered LWIR on the rate of cooling was so easily detectable at small scale. The reason for reducing the size of the water containers still further was to increase the speed of divergence between the samples and reduce the sophistication of the instrumentation required. This makes the experiment more easily replicable and accessible by others. Konrad, I’m still keeping an eye on this thread awaiting new modifications and result comparisons. Great work you are doing. Exactly what I have been saying for some time subject to slight refinement of the above. The 1mm deep ocean skin acting as a buffer between air and ocean bulk I would aver that the change in gradient across the skin is at a maximim at the top of the skin where all the action occurs but fades to zero at the interface between the skin and the ocean bulk. Thus no change in the rate of energy flow from bulk to skin. Air temperature is cooler likely because water is evaporating, nothing to do with radiation, which is a very weak energy transfer mechanism under most circumstances compared to conduction or physical transport or phase change. Water is cooling during the day and you notice the air is slightly cooler than the water. That is consistent with phase change combined with physical transport away of the heat as water vapour, which takes place with no temperature change of the transport medium. Keep in mind that water vapour is one of the lightest gases there is, is highly buoyant and will tend to rise. Willis Eschenbach over at Watt’s Up With That is deleting all references to this thread. Willis can’t deal with the thought of the back-radiation he’s come to accept not being able to warm the ocean. So rather than let people consider the merits for themselves he removes all references to the argument. He even announces his intent to censor in the OP. Willis explains that he has moved beyond this argument. Hardly. Willis has unilaterally decided he’s right and those who differ with him are wrong. That’s not moving beyond. That’s moving under as in an ostrich moving his head under the sand. I understand your frustration and I recall that Willis refused to engage sensibly on this issue on a previous WUWT thread. However in this circumstance Willis did indicate in the post that he did not want discussion of DLR in the thread. Further, he has not deleted all links to this thread. Sadly his responses to your comments have been unnecessarily rude. I find his misrepresenting your argument as “radiation cannot heat the oceans” without reference to wavelengths as particularly disturbing. I will not attempt to comment on that thread myself. As I say, I can understand your frustration, however the threat to thread bomb with a macro may be a little OTT. I hope you could indicate to Anthony that this was a reflection of how you felt rather than something you would actually do at WUWT. There’s no thread bomb macro. I was bluffing. Willis will simply have to continue to clip whatever comments of mine he believes is off topic. The cute part is that other WUWT moderators will approve those comments while Willis is sleeping so they’ll be there long enough for others to respond to them. I have years of experience as top level administrator on a highly trafficed controversial wordpress blog and managed multiple authors and moderators. I know how it works and what Willis is able to accomplish with his limited privilege level. Given the interest here and the better understanding of the physics of water and EMR I’d simply like to re-post the comments that Willis clips on this thread. Tallbloke rules, by the way. What’s probably the best one line description of the earth’s climate I ever read, and that I repeat often, was from Tallbloke a year or two ago: “In the big picture the sun heats the ocean and the ocean heats the atmosphere”. If you lose sight of that truism you’ll have no chance of further understanding the dynamics of the earth’s climate. Dave, how is it possible that shortwave radiation is the only source of ocean heating? Because the sun is its only significant source of energy and for all practical purposes there is zero longwave infrared energy in sunlight. But I see you already discovered for yourself that I was correct. Now you need to discriminate between the ways by which the ocean absorbs and gives up energy. Radiation from the sun is the only thing that penetrates it. That is it’s only source of energy. Longwave infrared is totally blocked by a surface layer that is only a few microns thick. This skin doesn’t mix downwards. Viscosity overwhelms all other forces in skin layer. The skin layer evaporates. Evaporation is the primary way that the ocean gives up absorbed solar energy – 70% of it. 10% is given up by conduction and the remaining 20% is via radiation. This is RADICALLY different from the way land and ice gain and lose energy. There is no comparison between the two. Greenhouse gases are quite effective over land because their mode of operation is via radiation and radiation IS the primary way that land surfaces give up solar heat. Radiative emission from the ocean on the other hand is not the primary means of giving up energy so greenhouse gases play commensurately smaller role there. Eschenbach refuses to acknowledge the difference between land and water and how they are quite different in the way they absorb and release solar energy. He’s decided that bringing up actual, well established physics that are counter to his anecdotally acquired beliefs is “thread hijacking” and has promised to deprive you of this information so that he may pursue his ridiculous wild geese flying through the clouds. I’ll clip this comment and post it to tallbloke’s website. Tallbloke has forgotten more science than Willis ever knew.